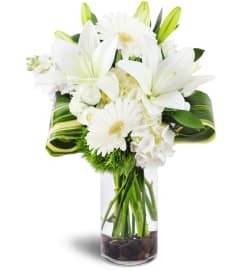 There's no better way to express your sorrow than by sending a beautiful floral arrangement. 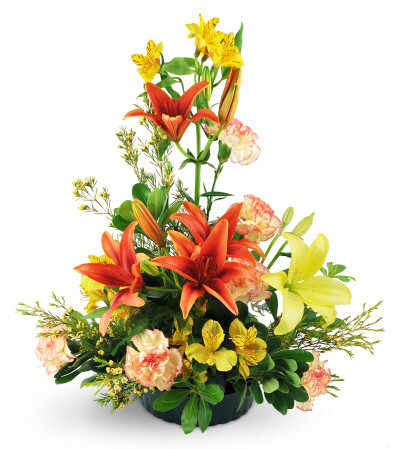 This gorgeous display features orange and yellow Asiatic lilies, bi-colored carnations and waxflower nestled in peaceful greens. It's a perfect way to show your sympathy and support. 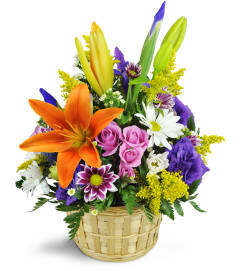 Yellow and orange Asiatic lilies are expertly arranged with carnations, alstroemeria, waxflower, pittosporum, and plumosa. Fresh and fancy! My favorite flower shop. Great selection. They had Purple Irises on Valentine's day. Excellent service, I asked for a get well basket yet elegant (like the lady they were for.) Told them they had artist freedom, the results speak for themselves, beautiful and elegant. Ali Bleu Flowers & Gifts is a Lovingly Florist in Austin. Buying local matters. Discover how Lovingly supports local florists. Copyrighted images herein are used with permission by Ali Bleu Flowers & Gifts.